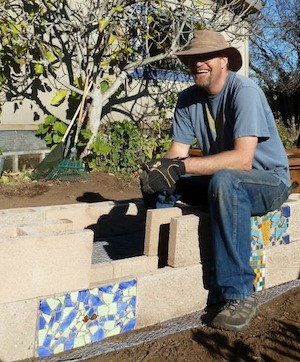 Over the years I have led many garden workdays at the Life Lab Garden Classroom and school gardens across California. In addition to the obvious goal of getting garden tasks accomplished, another big goal of a workday is to make volunteers feel that they are contributing to a worthy project. In my opinion the best workdays both complete needed tasks AND keep volunteers engaged. Here are some tips to running successful garden workdays. Please share your experiences and suggestions for running garden workdays in the comments section below. Get the word out to communicate what, where, when and who you want to attend. See some sample workday announcements at the end of this post. Running your workday on the weekend will allow more parents to attend; but I have also had success running workdays while school is in session, inviting whole classes out to the garden to help. Think of your garden workday as a work “party” and plan some festive elements. Play music, bring food, and include a few extra fun tasks even if they are not the most pressing items on your to-do list. For example, garden sign painting; harvesting and preparing a salad for the volunteers, popping popcorn, or juicing carrots; or even creating garden gifts for the volunteers, by picking bouquets, harvesting & packaging flower seeds, making herb bunches for drying, or starting seedlings for volunteers to take home. Often these fun, creative tasks draw the kids’ attention while parents do the heavy work of moving soil or weeding. Prior to the workday I like to share a list of tasks divided by age and skill level so volunteers know what to expect and come prepared with the right tools. If I will be providing tools and materials, I make sure they are ready and easy to access. If you are running the workday, don’t expect to get much garden work done yourself. As the leader of workdays I find myself acting mainly as a conductor, making sure everyone is paired with the best job for them, and looking ahead to see who can do what next. I keep a prioritized list of all projects updated throughout the day, based on how many people show up and who they are. Depending on the tasks and the size of your workday you may need to enlist project supervisors to lead specific tasks. For example, I always request other adults to take charge of overseeing the kid’s craft table, food prep (like juicing or salad prep), and the sign painting station. Having clear directions for set up and clean up of each station makes the day go more smoothly. Not all projects are suitable for everyone or every group size. As mentioned above, one of the most important things when running a workday is to keep people feeling engaged so they feel they are contributing. This means you will need to have tasks ready for a variety of skill levels and group sizes. crafts: flower pounding, seed saving/envelope making, garden stone decoration (pet rocks), flower pressing, stamping, etc. Post your task list on a board or chart paper so that you can easily share the day’s task list with volunteers as they arrive. Prioritize the list so that the most important jobs are sure to get done. Plan time for clean up and include this in the posted schedule. Take signups for cleanup tasks before the end of the day, so that the cleanup doesn’t fall to just a few people. Plan more than you think you can accomplish and have your main goals prioritized. Document your workday; ask a volunteer to take before and after photos and action shots. You can share these with participants later, or choose a key photo or two to create thank-yous for participants. Keep in mind that many people join garden workdays to learn new skills, so be patient and be prepared to facilitate teaching along the way. Share resources on gardening, such as informational websites, seed or garden catalogues, handouts, reference books, etc. Invite participants to take a bit of the garden home with them, even if this just means a small bunch of herbs or some seeds they can harvest from spent flowers. Mark your tools, and provide masking tape and markers for participants to mark their personal tools. If neccessary, use some sort of online form like Google Forms to create a RSVP list so you know how many people to expect. Most of the workdays I have run are at established garden sites. But your workday might be a garden install. Lola Bloom of CityBlossoms in Washington, D.C. shared the following suggestions for running a garden install day. They also collaborated with Nature Works Everywhere to make videos on planning gardens, building a garden in a day, and more. Have a map and mark out the whole garden plan (with stakes and string or spray paint) so that newcomers to the space can better envision the plan. Share images and clear instructions of what the volunteers will be creating. A picture tells a thousand words. Don’t rush the process; it is better to have things done right than to be correcting mistakes later. Be prepared with everything you will need and plan for the unexpected. This means you might want might back-ups of important tools, extension cords, or charged power tool batteries. You don’t want your crew to be sitting around waiting for batteries to charge or having to share one drill driver at a garden bed building day. Pacific School Life Lab Garden Workday ran during the school day. Altamont Creek School Garden Workday ran on a weekend. Come spend the day in the garden! We will have a large load of compost delivered to the garden that morning and will have endless fun clearing beds and then filling the depleted beds with compost. Come at 10:30 and stay through lunch. I can envision us having the momentum to work for 2-3 hours, but stay as long or as short as you wish. I will be there to keep projects flowing. We will also have a group of 8 UCSC Life Lab interns and two Life Lab Staff joining us. One big last push before winter break! We have plenty of lettuce, please bring salad ingredients pre sliced or bring what you need to prep it. Or a dressing. Digging Forks, Shovels, or Spades if you got them. Make sure to mark them so you can tell which are yours. We were so lucky to have you volunteer with us last time, and we are looking forward to the progression of our garden here at Life Lab. Because of all of your hard work and the great progression of the project, we have already established our next Work Party. Below you will find details, and if you are interested in volunteering with us, please don't forget to RSVP! As always, feel free to e-mail me with any questions, comments or concerns. We look forward to seeing you then! Join us for a Work Party! Thanks to the Captain Planet Foundation Grant we are renovating our Kitchen Garden here at Life Lab. With your help, we will be able to continue building our garden that will be used as a demonstration and resource for other school garden educators. 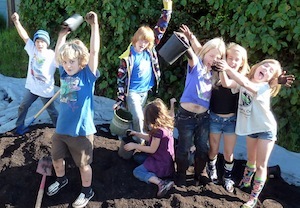 We will be constructing garden beds, filling in compost and soil, and most of all having fun! What to Bring: Bring layers, a hat, sunscreen, gloves and water! Snacks will be provided, but please bring a lunch. You're invited to the biggest, best party in town! Pacific School Life Lab Garden Parteeee!!! We will have jobs for all abilities from making pet rocks to plumbing the kitchen sink! We have plenty of tools to share and extra gloves. Sign painting supervisor - someone to work from a list of prioritized suggested signs and help out painters to get signs completed. Kid's craft table, someone to oversee kids in simple crafts like drawing on rocks and paper pot making. Other craft ideas are welcome if you want to bring em. Juice mix master - someone to lead the juicing table, helping to wash, cut, make and share juice. 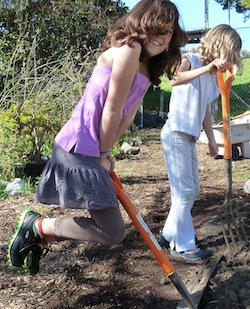 This post is part of our Sustaining School Gardens articles.